Based on reviews from 1,880 users. 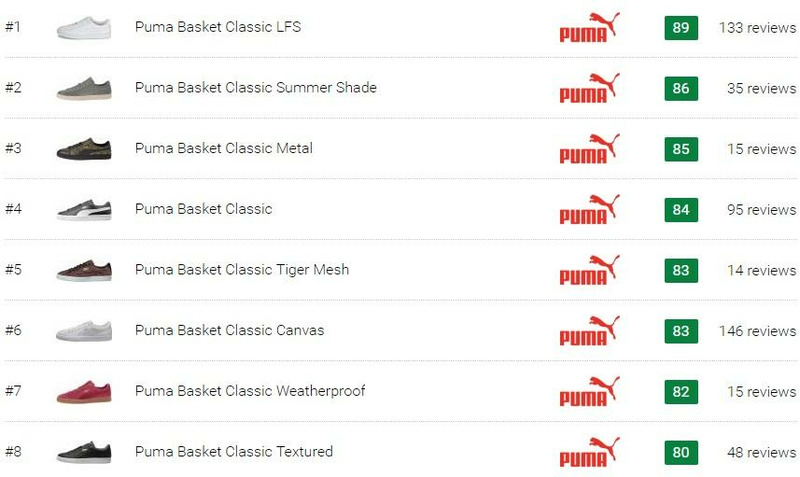 Learn how our rankings work or see our guide to Puma Basket sneakers. Updated Apr 2019. Initially intended for basketball, the Puma Basket was released in 1968. With a low-top silhouette, it had an all-leather upper that later cemented its name and became popular in the hip-hop world as well. From basketball footwear, it transcended into a lifestyle silhouette in several key cities such as Chicago, New York, and Houston. The Puma Basket sneakers had proven durable and were released in different iterations for so many years. 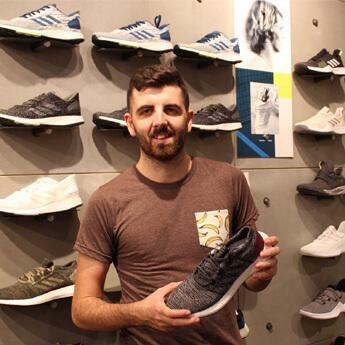 These sneakers are also available in a variety of colorways such as green, blue, black, white, pink, red, grey, and brown that men and women of all ages can comfortably wear while remaining stylish. Some iterations are only released for men or exclusively for women, while others are available in both men’s and women’s sizing. Among the most sought-after Puma Basket footwear are the Puma Basket Maze, Puma Basket Mid GTX, Puma Basket Ostrich, Puma Basket Platform Satin, Puma Basket Platform Core, Puma Basket Bling and Puma Basket Bow. Let me discuss several different iterations as we delve into the details further. With a low-top silhouette, the Basket Classic from the Jumping Cat has a leather upper that keeps the foot fresh. It has the known Puma Formstripe that boast the brand’s existence. This shoe is among the Puma Basket sneakers that are available at a budget-friendly rate. Fit and Sizing: The Puma Basket Classic is available in sizes from 3 to 12 and 3 to 14 for women and men respectively. It is among the Puma Basket sneakers that have a lace-up closure system that provides a snug fit. It has a rubber outsole that provides a reliable grip. Colorways: With sleek and straightforward design, it is available in different colorways including red/white and black/white, among others. The pure white colorway is the most sought-after shoe since it can easily blend with different colored outfits. Suggested Styling: It is among the versatile Puma Basket shoes that work well with shorts, jeans or khaki pants. Ladies can also pair it with their skirts. Released on October 19, 2017, the Puma Basket Classic “Day of the Dead” was launched in celebration of the ‘El Dia de Los Muertos’ festival in Mexico which honors the departed loved ones. It is among the Puma Basket sneakers that draw inspiration from the Calacas, the iconic skull figures, which symbolizes a colorful reunion of the dead and living in contrast to the somber day of mourning. Fit and Sizing: With a low-top silhouette, the Puma “Day of the Dead“ is one of the iterations of the Puma Basket sneakers that have a lace-up closure system for a snug and flexible fit. It has the jacquard-constructed upper that features the Puma Formstripe as well as the heel counter and toe areas with suede overlays. Colorway: The Puma Basket Classic “Day of the Dead” is released with a textile-printed upper in a black colorway. A black suede detailing accented all over the upper. Suggested Styling: Like most of the Puma Basket shoes, this shoe works well with denim jeans and shorts. Women may even wear it with skirts. The timeless Puma Basket Classic LFS is built with a leather upper that sits atop of a rubber outsole, providing foot breathability and a sure-footed grip. Made with premium materials, this shoe is up for grabs at a budget-friendly rate. Fit and Sizing: It is available in sizes from 5 to 12 and 4 to 11 US for women and men respectively, in medium width. Like most of the Puma Basket sneakers, this footwear has a lace-up closure for an optimal fit and secured lockdown. It has a padded tongue and ankle collar for added comfort as well as mesh lining for a great next-to-skin feel. Colorway: Among the Puma Basket sneakers, this iteration has colorways available including Black/Team Gold, Black/White, White/Black, White/White, and Puma Royal. Suggested Styling: This sneaker can be paired with different casual clothing such as denim jeans, khaki pants, and shorts. It also looks good with sporty outfits such as jogger. The unique, holographic-treated Basket Classic provides a unique design. Among the Puma Basket sneakers, this shoe can turn heads around as it shines whether exposed on direct sunlight as well as with indoor or outdoor artificial light, catching the attention of others. It can be grabbed at a budget-friendly price. Fit and Sizing: Among the unisex Puma Basket shoes, this shoe is available in sizes from 5.5 to 10 and 4 to 14 US for women and men respectively. It has a lace-up closure system for a flexible fit. A flexible shoe, it has a grippy rubber outsole for stability as well as a padded ankle collar for added comfort. Colorway: The Puma Basket Classic Holographic is available in colorways including Puma Black, Gold, Puma Silver, and Green. Suggested Styling: Featuring a holographic print, this shoe is among the Puma Basket sneakers that can go well with jeans, shorts, and joggers. Ladies can match it with skirts too. The Puma Basket Classic Soft has a combination of modern design and retro appeal. Like most of the Puma Basket sneakers, it is a versatile shoe that is available at a budget-friendly pricing point. It has a deconstructed upper that gives a timeless look. Fit and Sizing: With a low-top silhouette, this footwear is among the Puma Basket sneakers that men can pick sizes from 6 to 14, in medium width. Its soft leather upper, as well as the perforated tongue, provides foot breathability. It also has a rubber outsole that offers reliable traction. Colorway: The Puma Basket Classic Soft is available in colorways including Olive Night, Sailor Blue and Rock Ridge. Rock Ridge colorway can be closely identified with a grey palette while the Olive Night is like the dark-colored green leaf. Suggested Styling: Like most of the lace-up Puma Basket sneakers, this shoe looks good with roll-up denim jeans, fitted pants, joggers, shorts as well as khaki pants. Ladies can also wear it with their skirts and skinnies. Released in 2016, the Strap version of the Basket Classic comes in two versions which are with a leather upper, and the other one is the suede upper. The perforated Puma Formstripe is accented on the side panels of the upper while the Puma Cat logo is visible on the heel counter. Unlike most of the Puma Basket sneakers, this low-top footwear has the Velcro strap, instead of a lace-up closure system, for a secured lockdown. Fit and Sizing: The shoe is offered in men’s sizing. However, this footwear is among the Puma Basket sneakers that are unisex in styling, so women can also try to grab a pair by getting 1.5 sizes down from the men’s sizing to get their exact fit. It has a lightly padded footbed and synthetic lining for added comfort. For reliable traction, a rubber outsole s installed. Colorway: The suede version is available in colorways including Blue Fog, Natural Vachetta, and Agave Green while the leather version is available in white and black colorways. Suggested Styling: Like most of the stylish and unisex Puma Basket shoes, this shoe can perfectly match a variety of casual clothing like shorts, jeans, and skirts. Accented with shining geometric print, the Puma Basket Classic Metal received an update that let heads turn around. It is among the Puma Basket sneakers that have a fashion-forward look with uncompromising comfort. From the name itself, it has a synthetic upper that got a metallic look. It has the classic leather Puma Formstripe stitched on the side panels. Fit and Sizing: Like other unisex Puma Basket sneakers, this shoe is available in sizes from 5.5 to 11 and 4 to 13 for women and men respectively, in a medium width. With a smooth leather upper, the shoe provides foot breathability. It also has padded tongue and collar that offer additional comfort. Colorway: It is available in colorways including white and black. The black colorway is accented with a metallic gold geometric print while the white colorway has a silver palette overlay. Suggested Styling: This shoe is among the versatile Puma Basket shoes that look great with a shirt and rolled-up jeans for a laidback look. Men can also wear it with their shorts or joggers as well as fitted pants. Available at a budget-friendly rate, the Puma Basket Classic Tiger Mesh is designed with a low-top silhouette. With style originated back in 1971, this version has a material update with its exotic tiger prints. It comes with round laces. Fit and Sizing: It has a canvas upper that offers optimum foot breathability. With a flexible midsole, this shoe is among the Puma basket sneakers that have adequate footbed cushioning for shock absorption and comfort. It is available in sizes 6 to 14 US for men. Ladies just need to pick 1.5 sizes down from the men’s sizing to get their exact fit. Colorway: Like other Puma Basket sneakers, this shoe is available in a variety of colorways with an animal-printed upper such as the Asphalt/Puma Black, Red Blast/Puma Black, Puma Royal/Puma Black, and Safety Yellow/Puma Black. Suggested Styling: With a minimalist yet sophisticated design, the Puma Basket Classic Tiger Mesh looks good with rolled-up jeans, fitted pants, shorts or joggers. It also works well with skirts for women. With an affordable rate, the low-top Puma Basket Classic Winterized has a classic and sleek silhouette that offers the perfect combination of comfort and style. It is among the Puma Basket sneakers that provide enhanced protection against the cold weather. This lace-up footwear has a tonal upper with its contrasting gum outsole, offering an added style. The Puma Formstripe in a suede material is stitched on the side panel. Fit and Sizing: This sneaker is available for men in sizes from 8.5 to 13 while women can pick from 6.5 to 10, in medium width. An inspiration taken from the Basket’s predecessor, it has a suede upper that complements with its rugged laces and durable outsoles. Colorway: It is available in colorways including Winetasting which looks like dark purple or eggplant, Taffy which resembles the brown color and of course the Puma Black. Suggested Styling: Perfect during cold weather or casual walks, this shoe is one of the Puma Basket shoes that can quickly work well with fitted jeans, khaki pants, and other casual clothing. With a classic Puma style, this sneaker has a weatherproof nubuck leather upper that protects your feet from being wet. A lace-up closure is integrated to its tonal upper which sits atop a durable gum outsole. Fit and Sizing: This shoe is one of the Puma Basket sneakers that have a flexible midsole and cushioned footbed that both provide adequate shock absorption. It also has a mesh lining for an excellent next-to-skin feel while the padded tongue and ankle collar give an added comfort. Men can pick in sizes from 4 to 14. Ladies can get a pair by ordering 1.5 sizes down than their usual size to get their exact fit. Colorway: With a tonal upper, this shoe is available in colorways including Green Gables, Taffy, Tibetan Red, and Puma Black. The Taffy colorway resembles the brown palette. Suggested Styling: A rustic beauty in a retro style, this footwear is one of the stylish Puma Basket sneakers that look great with shorts and denim jeans, among other casual outfits. It looks great with sporty shorts and joggers as well. The favorite basketball shoe in the ‘70s, the Puma Basket Heart Patent received an update with a more feminine look. It has an oversized pair of shoelaces that exudes a feminine vibe, providing a more stylish appeal. Among the fashionable Puma Basket sneakers, this lace-up footwear features a smooth synthetic leather upper that sits atop of a durable outsole. Fit and Sizing: This shoe is among the Puma Basket sneakers that are offered in women's sizing from 5.5 to 11 US. The lace-up closure system gives a secured fit while the padded tongue and collar provide comfort. It also has a cushioned footbed that offers all-day support as well as comfort. Colorway: Like other Puma Basket sneakers, this shoe is available in different vibrant colorways including Puma White, Puma Black, Rock Ridge, Peach Beige and Iron Gate. The Iron Gate resembles a dark grey palette while the Rock Ridge is a lighter shade of grey. Suggested Styling: Ladies can wear this sneaker with their skirts and topped it with a long-sleeve knitted shirt for a more feminine vibe. This sneaker also looks good with leggings, denim jeans, and shorts, among other casual outfits. Among the iterations of the Puma Basket shoes, this version features a four-color blocking with an oversized striped shoelace, providing uniqueness to its silhouette. It has a clean design yet exudes elegance. An extra woven bow lacing is provided as well. It has the leather Puma Formstripe contrasting the color of the rest of the upper. Fit and Sizing: Ladies can pick from sizes 6 to 11 US. Like other Puma Basket sneakers, it has a leather upper that ensures foot breathability. It also has cushioned tongue and collar for increased comfort while its rubber outsole gives reliable traction. Colorway: The Puma Basket Heart New School is available in colorways including Puma White/Puma White and Cerulean/Cerulean. The Cerulean resembles close to a blue palette. Suggested Styling: Among the versatile Puma Basket sneakers, ladies can wear it with their roll-up jeans, leggings, fitted pants or shorts. It also looks good with skirts, providing a more feminine vibe. With a fashionable look, the denim-designed upper of the Basket Heart maintains its aesthetic appeal without compromising comfort. It is among the stylish Puma Basket sneakers that can be grabbed at a budget-friendly pricing point. With a cute upper, it has the Puma Formstripe at the lateral and medial sides. The durable denim upper is designed with dots and accented with suede and leather overlays, giving an added style. It also has a grippy rubber outsole. Fit and Sizing: Women can pick from sizes 6 to 11 US, in a medium width. Among the Puma Basket sneakers, it has the Eco Ortholite sockliner that provides comfortable wear. It also has a mesh lining as well as cushioned tongue and ankle collar for additional comfort. It has oversized satin laces that provide a flexible fit. Colorway: The low-top Puma Basket Heart Denim is available in colorways including Halogen Blue/Twilight Blue, Oatmeal/Twilight Blue, and Twilight Blue/Halogen Blue. The Oatmeal color resembles a darker cream palette. Suggested Styling: Like most of the Puma Basket shoes, it has a sophisticated and eye-catching design that looks good with skirts, jeans, leggings, and shorts as well. Another iteration of the Puma Basket sneakers that are designed exclusively for women. Other merchants referred to it as Puma Basket Heart Hyper Embossed or Puma Basket Heart Hyper Embroidery. Instead of the Puma Formstripe, an embroidery of flowers is placed on the lateral panels instead, giving a more feminine touch. The embroidered floral detailing will surely turn heads around. It has a tonal textile upper which is complement by its oversized satin laces. An extra pair of canvas shoelaces comes with the shoe. Fit and Sizing: Like most of the Puma Basket sneakers that are available for women, this shoe is available in sizes from 4 to 12 US, in medium width. The lace-up closure provides an adjustable fit. It has a velvet upper that keeps the foot fresh while lightly padded collar and tongue provide support and added comfort. Colorway: It is available in Rock Ridge, Peach Beige and Puma Black colorways. The Rock Ridge resembles closely to a grey palette. Suggested Styling: This shoe is one of the Puma Basket sneakers that have a casual look yet exude elegance. It looks great with cuffed jeans, dresses, skirts and shorts, among other casual and semi-casual outfits. With a classic look, the Puma Basket Heart DE features a round toe style attached on a leather upper with a straightforward design. Although with a vintage look, it still manages to exude the elegance that will turn one's head around. It comes with both oversized and flat shoelaces. The contrasting Puma Formstripe is found on the sidewalls. Fit and Sizing: Like some of the Puma Basket shoes, it has a leather upper that sits atop a durable outsole, keeping the foot fresh and stable. The Ortholite sockliner not only keeps the foot dry but also ensures comfort. It also has a breathable mesh lining that provides an excellent inner climate for the foot. Ladies can pick sizes from 6 to 11 US, in medium width. Colorway: The Puma Basket Heart DE is available in colorways including Blue Depths/Puma White, Puma Black/Puma White and Toreador/Puma White. The Toreador colorway resembles closely to a red palette. Suggested Styling: It is among the Puma Basket sneakers that possess an elegant look with a sporty vibe. This sneaker looks good with maxi dresses, track pants, leggings, denim jeans, and leather pants. With a timeless silhouette, the Puma Basket Heart Corduroy has a tonal upper that complemented by a gum outsole, providing a straightforward design. Both the upper and oversized laces have corduroy texture. The Puma Formstripe perfectly blends at the lateral sides of the upper while the Cat logo is embroidered at the heel counter. The Puma branding also sits on top of the tongue. Fit and Sizing: Like most of the Puma Basket sneakers for women, it is available in sizes from 5 to 12 US. A modified Basket Heart version, it has a corduroy upper that keeps the foot fresh. It also has a breathable mesh lining with Ortholite sockliner, providing comfortable wear. Colorway: This sneaker is available in colorways including Dusty Coral, Pomegranate and Puma Black. Like the fruit, the Pomegranate resembles closely to dark red while the Dusty Coral has the blend of peach and pink palettes. Suggested Styling: Like other versatile Puma Basket sneakers, the Puma Basket Heart Corduroy works perfectly with leggings, fitted or cuffed denim jeans, skirts, shorts as well as dresses. The Basket Platform maintained its classic silhouette but received a modern update by adding height to its durable outsole. Like most of the Puma Basket sneakers, it is lace-up-designed footwear that keeps the foot secure in every step. It has the Puma Formstripe stitched on the lateral sides of the shoe. Fit and Sizing: With a low-top silhouette, it is available in women’s sizing from 5.5 to 11 US. Depending on the colorway, the upper can be made of a synthetic, knit textile or leather material that provides foot breathability. It also has a durable outsole for foot stability and reliable grip. Colorway: Like most of the Puma Basket shoes, this iteration is available in a variety of colorways including Quarry/Quarry/Whisper White, Puma Black/Puma Black/Whisper White and Burnt Olive. Suggested Styling: Among the versatile Puma Basket sneakers, it can work well with denim jeans, shorts, skirts or even dresses. Inspired by the grunge fashion movement in the ‘90s, the Puma Basket Platform Reset has a low-top silhouette that exudes versatility and elegance. Among the Puma Basket sneakers, this footwear has a tonal suede upper with a round toe design that matches its platform outsole. It still got the Puma Formstripe on the lateral side and jumping cat logo at the heel counter. Fit and Sizing: Like other women-specific Puma Basket sneakers, it is available in sizes from 6 to 11.5 US. It has a lace-up closure system for a secured lockdown and rubber outsole for excellent traction. Colorway: This shoe is available in different colorways including Gray Violet/Gray Violet, Puma Black/Puma Black, Prism Pink/Prism Pink, and Aruba Blue/Aruba Blue. Suggested Styling: Like other versatile Puma Basket sneakers, this shoe can work well with casual and semi-casual outfits. It looks good with dresses, cuffed jeans, skirts, shorts or leggings. With a low-top silhouette, the Puma Basket Platform Metallic is built with a leather-coated upper with a reflective metallic layering. The sturdy patent leather upper brings foot comfort against the cold weather. The lace-up sneaker has a chunky outsole that measures approximately an inch high. Fit and Sizing: Like other women-specific Puma Basket sneakers, this shoe is available in sizes from 6 to 12 US. It has a rubber outsole with ridged tooling at the toe area. Colorway: It is available in several colorways including High-Risk Red/High Formula, Gold/Puma Black, Black and Silver/Puma Black. Suggested Styling: It is among the versatile Puma Basket shoes that look good with leggings, cuffed pants, distressed denim jeans, shorts, and skirts. It matches skirts well too. Another version of the Puma Basket sneakers with a low-top silhouette, the Puma Basket Platform Big Strap has an outsole that measures approximately 1.5 inches high. It is designed with an oversized hook-and-loop strap that sits on top of its tonal upper. The shoe has a combination of a classic style with a modern update, exuding a fashionable look. Fit and Sizing: It is available in sizes from 5.5 to 11.5 US. Unlike most of the Puma Basket sneakers, this shoe has an oversized Velcro strap that provides foot a secured lockdown. It also has a leather lining and padded ankle collar for added support. Colorway: It is available in colorways including Puma Black/Puma White, Apple Cinnamon and Puma White/Puma White. Suggested Styling: Like other stylish Puma Basket sneakers, the Puma Basket Platform Big Strap looks good with shorts, leggings, cuffed jeans or skirts. For an edgy look, it is nice to pair it with distressed denim jeans. Launched in 1968, the Puma Basket is initially a leather shoe which was an answer to the Suede that was released on the same year. With a distinctive look, it has a clean and simple design yet exudes sophistication. It was built on the original Puma Suede tooling that gives a classic look. As Puma unceasingly finds and makes way to invent and release innovative footwear using its classic silhouette especially for women, Senior Designer Sportstyle Footwear Carly McKenzie led and directed the design of the Puma Basket Heart’s creation. Boys used fat laces in their footwear back in the 1970s. McKenzie drew inspiration from it and incorporated it into the Puma Basket Heart. She reinterpreted an element and gave a feminine twist to create a style made specifically for women. Where can I purchase the Puma Basket Sneakers? Where are Puma Basket shoes made? Puma sneakers can be made from Vietnam, Cambodia, China, Bangladesh, and Indonesia. Are Puma Basket kicks vegan? Launched in 2011, the Puma’s “Re-suede” comprises 100 % recycled materials. It has a Double R Rice Rubber outsole that came from the rice husks which replace a portion of the latex content, saving fossil-fuel energy. Another vegan-friendly iteration is the Puma Basket Heart Hyper. How to care for the Puma Basket sneakers? Immediately clean the shoe after use when exposed to dirt or mud. Dry your Puma Basket sneakers by removing the footbed and allowing them to air dry. Never machine-dry or machine-wash your Puma Basket sneakers. Keep your Puma Basket shoes away from extreme heat like dryers, space heaters or radiators. Pack your Puma Basket sneakers with crumpled newspapers to help them retain their shape. What are the proper ways of cleaning the Puma Basket shoes? Leather: Do not soak in water instead wash it hands using a soft cloth dampened with cold water and mild soap. Suede & nubuck: Utilize a brush that is designed specifically for suede, keeping the outside surface clean. Synthetic leather: Use a soft bristle or cloth and gently scrub the upper using cold water and mild soap. Nylon & canvas: Use a soft cloth and gently scrub the upper using cold water and mild soap. Do not use harsh cleaning agents. Are Puma Basket casual shoes available for men? The Puma Basket Classics are unisex in style. Most of them are available both in men’s and women’s sizing. However, the Puma Basket Heart and some Puma Basket Platform shoes are made exclusively for women. What materials are often used with Puma Basket sneakers? Depending on the design and model, some Puma Basket sneakers have an upper made of leather, synthetic or canvas. What are some of the collaborative works for Puma Basket shoes? a. K-pop headliner BTS teamed up with Puma to create a sneaker that will help you get down. Available only in men’s sizing, the BTS x Puma Basket Patent has a unisex style, so women just need to pick 1.5 sizes from their usual foot measurement to achieve an exact fit. Putting their own spin, BTS designed the sneaker with a combination of white and crisp blue palettes. It also has hits of gold all over the upper as well as the signature flower logo found at the heel. b. Puma x Sesame Street Collection was released at select Puma retail stores on March 10, 2017. This iteration of Puma Basket sneakers is available in different characters and colorways. Character Elmo will be on a Puma Basket with a red upper, Cookie Monster with the blue upper while Cookie Monster, Ernie and Bert are seen on the cream upper. What available colors do Puma Basket kicks usually have? Puma Basket sneakers are usually available in black, white, red, grey and brown colorways. What is the price range of the Puma Basket sneakers? Most Puma Basket shoes are available at a budget-friendly and affordable price.